Why are only some of the fills for my Strater lithology log exported to the DXF file? In Strater 5, Vector, Line, and Solid fill styles are exported to DXF files. Image, Gradient, and Stock styles are not exported to DXF files (a solid fill is exported instead). You can tell what type of pattern you have by selecting the filled object. The style type is listed in parenthesis after the layer name in the Property Manager. In Strater 2-4 and above, none of the patterns get exported to DXF files. The polygons will simply be filled with the foreground color. 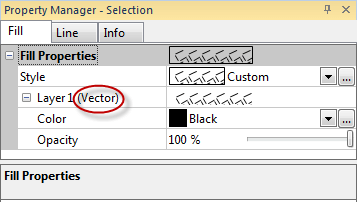 In Strater 1, the Vector and Stock patterns are exported to DXF, but the bitmap and picture patterns are not because the R13 and R14 DXF formats do not support images. You can tell what type of pattern you have by selecting the fill pattern drop down menu. The first line at the top of the drop down shows you the fill pattern name (outlined in red below), and the second line shows you what type of pattern it is (outlined in blue below). What is Math Text and how can I use it to permanently format the text in Strater's data table?